This weekend we honor our fathers – their love, their support, and the impact they’ve had on our lives and the people we’ve become. At Walt Disney Imagineering, father and son Imagineers Rolly Crump and Chris Crump have each brought to life iconic figures at Disney Parks – Rolly with “it’s a small world,” the Haunted Mansion and the Enchanted Tiki Room (to name just a few), and Chris with “a bug’s land” at Disney California Adventure park, Monsters, Inc. Ride & Go Seek! at Tokyo Disneyland and most recently The Little Mermaid ~ Ariel’s Undersea Adventure. Chris shared with the Disney Parks Blog his memories of growing up with – and then growing up to become – an Imagineer. What was it like to have an Imagineer as a dad? Being a kid with Dad working for Disney in the 1960s, getting to go to Disneyland for free whenever we wanted – are you kidding? Rolly would share stories of working with Walt when our family was eating dinner. It was an exciting time, and the stories were inspirational. Watching Rolly and Walt on TV together talking about “it’s a small world” was a real highlight of that period of time. Did your father ever take work home with him, or were you ever involved in any of his projects when you were a child? I used to visit my Father at WED (original name of Walt Disney Imagineering) in the mid-sixties. I got to walk around the model shop, see what everyone was working on. Rolly was working on the show models for “it’s a small world.” So I was aware of model building – the tools that were used. I started building model kits at home, and Rolly would bring me supplies – paints. One of the first Xacto tool boxes he bought me, I still have a pair of tweezers from that tool box to this day. Did you always want to be an Imagineer as well, or was it something you were drawn to later as an adult? I started working with Rolly on a project for Knott’s Berry Farm (Knott’s Bear-y Tales) in the mid-seventies. Coming to Imagineering didn’t really hit me until the late 1980s. While shopping in Century City, I ran into (now former Imagineer) Eddie Sotto – and Eddie had just started to work at Disney. 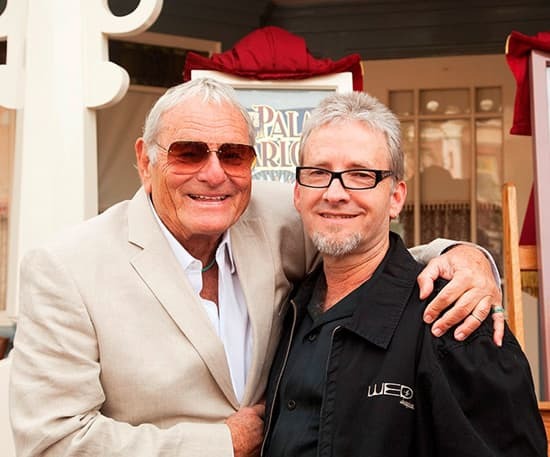 It was a seed that Eddie Sotto planted that just got me thinking about coming to WDI. What does your father think of your work as an Imagineer? When I shared with him the 3-D models that we generated to design “The Little Mermaid” attraction, Rolly realized that I am working in a completely different environment than he was back in the day. He is very impressed with the technology that we have now, and has shared with me that he is very proud of what I am doing with the company. What did you learn from your father that you’ve used in your career as an Imagineer? What I observed was that Rolly had really great relationships with the people that he worked with. What we do every day is work together in the spirit of collaboration. It is important to know the skills of your co-workers, and to trust and respect them. I watched Rolly interact with his peers, and was impressed with how well-respected he was then, and is to this day. Being respected is earned, and it’s something that I work at all the time. Which of the attractions that your father worked on is your favorite? Does he have a favorite of yours? “it’s a small world” has been built five times over the last forty-some years. All around the world people keep lining up to go on it. There are only a few attractions in our history that have had that kind of appeal and staying power. I’m guessing he will like The Little Mermaid ~ Ariel’s Undersea Adventure the best. It’s going to be the family attraction that will entertain guests for years to come – as close to an “old school” style attraction, in the classic dark ride tradition. Has there been a project that you’ve worked on together? It was Wonders of Life for Epcot. I had just started at WDI, and Rolly was freelancing. I called him up and told him there was something in the pavilion that was right up his alley. He stopped me as I was talking and said, “Are you offering me a job at Disney?” It was just for a few months, but we had a good time working together – we always have. That’s such a neat story! I hope to become an imagineer someday! That would be the coolest job in the world, and i think i’d be good at it! What an inspirational story- so many times you hear of dads passing on the company business to their sons, but this is a wonderful twist! Leave it to Disney to make such a mundane event into something magical. Great job father and son. The legacy continues….. So cool. This is an interesting article. I think it’s wonderful that Chris continued in the footsteps of his father, both have brought joy to so many people. I don’t doubt Chris will be as legendary as his dad someday, he already has quite the resume! So cool, I have a friend that was an Imagineer and has great stories of the years between about 1997 – 2006. Also my other friend’s father was an imagineer that worked on some of the classic rides including developing Splash Mountain. He has some great stories of working with his dad on the models too. What a great story!! Your father must be so proud! !